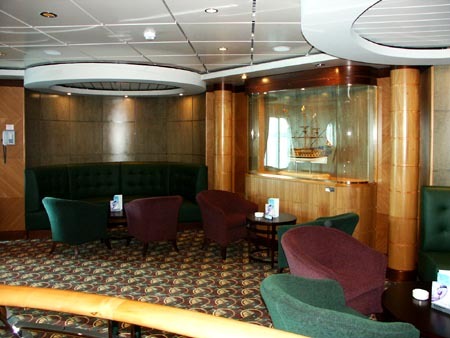 This page is one of a series devoted to postcards and photographs of the P&O cruise ship Arcadia of 2005. 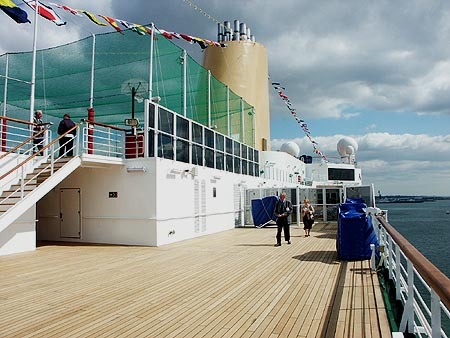 She is the fourth ship of this name in the P&O fleet. 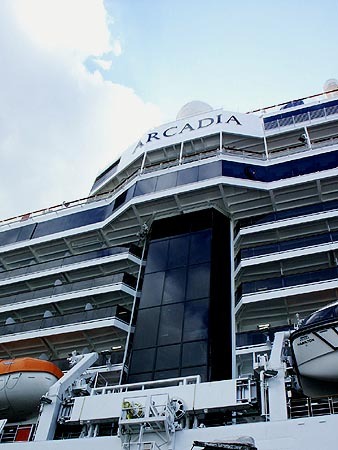 Arcadia (4) entered service in April 2005, built by Fincantieri of Italy. 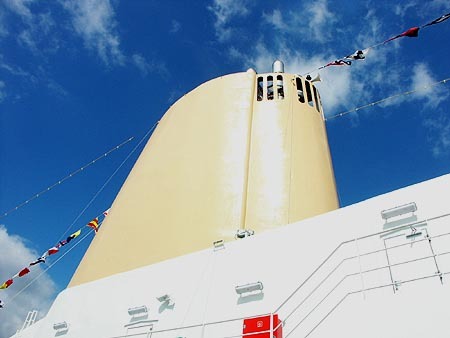 She was originally ordered for Carnival subsidiary Holland America, but later reassigned as the Queen Victoria of Cunard Line. 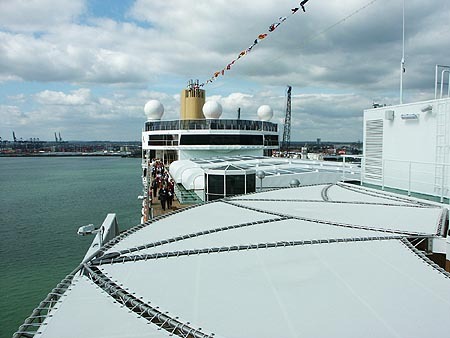 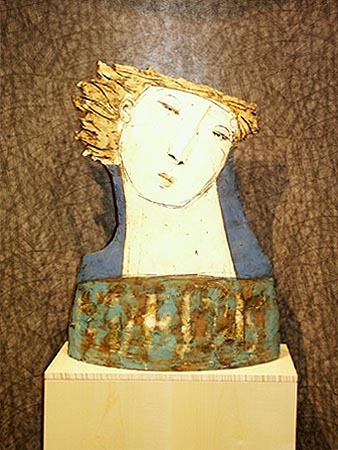 Finally, she was transferred to P&O Cruises as the Arcadia (4). 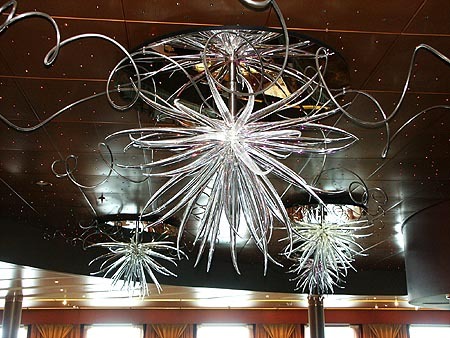 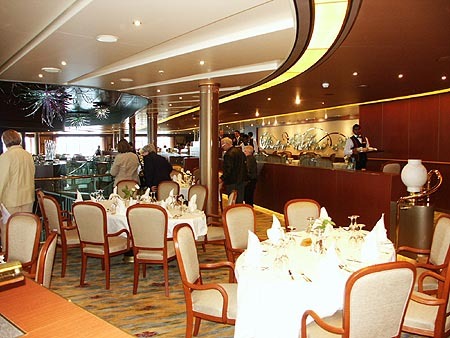 A new Queen Victoria of similar design has been ordered from Fincantieri for delivery to Cunard in 2007. 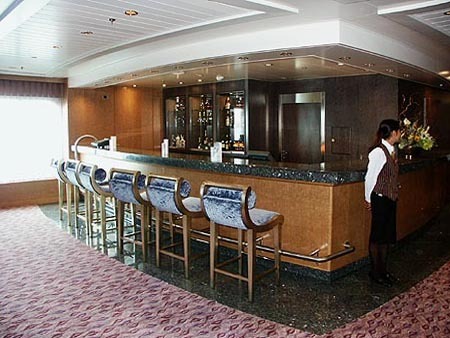 Arcadia (4) - 2005 Page 3 - Photographs - Arcadia's interiors and open decks - this page! 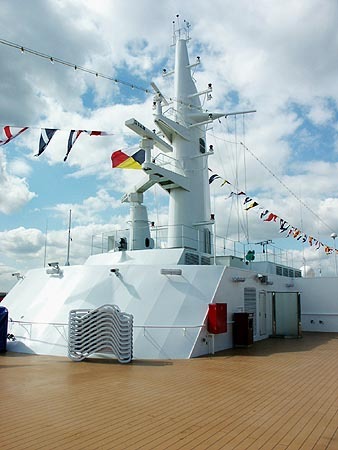 This is a tour of the ship starting at the bow on each deck. 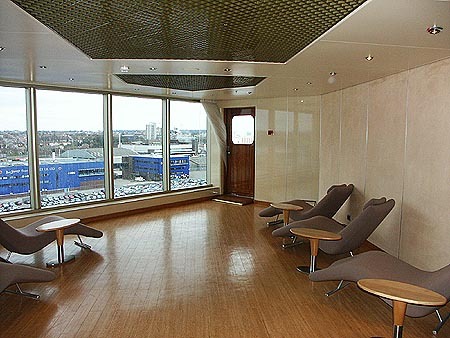 G Deck 1 has the Reception, Tours Office, cabins (without balconies) and the lowest level access to the Atrium and the Palladium Theatre. 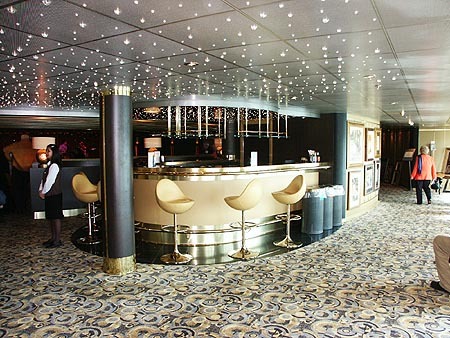 There is also access to the Palladium on the two decks above. 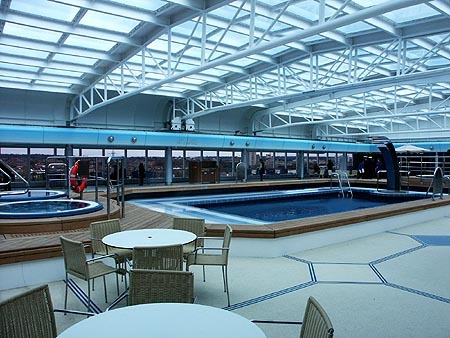 The Atrium is small and functional compared to many modern cruise ships. 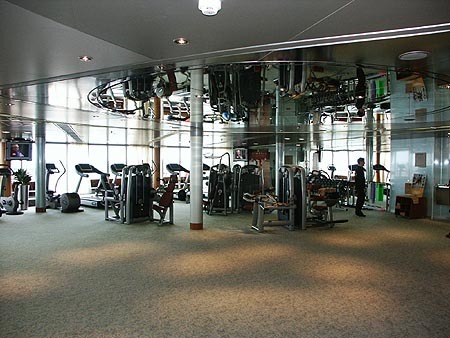 External lifts with sea views connect the various Atrium levels. 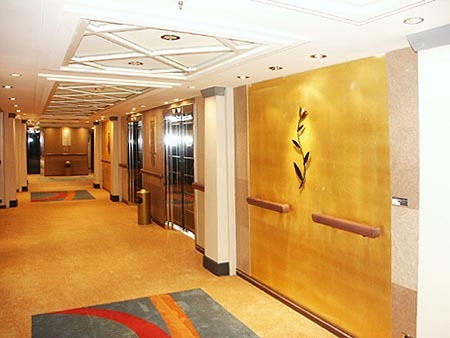 External lifts with sea views connect the various Atrium levels. 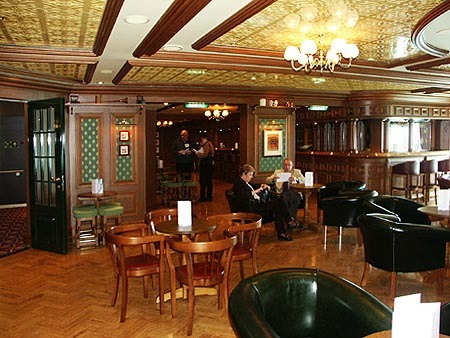 Photo &COPY; Ian Boyle, 10th April 2005. 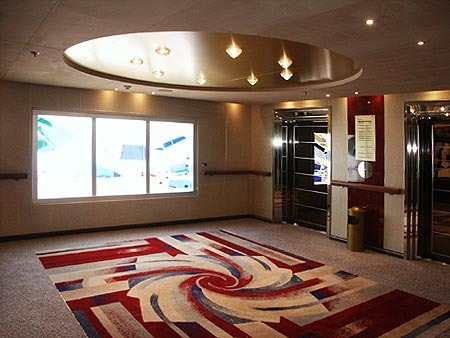 Florida Deck 2 begins with the middle level access to the Palladium Theatre at the bow, followed by the Monte Carlo Casino, Rising Sun Pub, Electra nightclub, Globe show lounge, Arcadian Rhodes Restaurant, Intermezzo & Spinnaker Bars, and the lower level of the Meridian Restaurant. 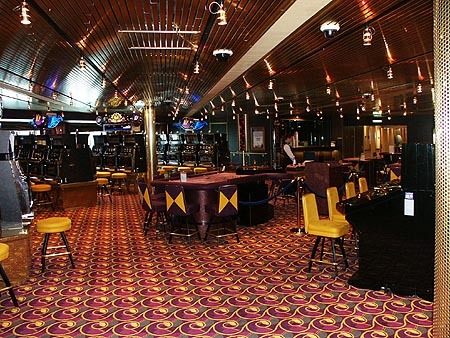 Florida Deck 2: The Monte Carlo Casino. 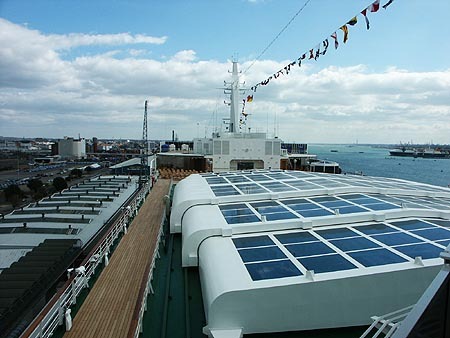 Florida Deck 2: The Rising Sun Pub (named after the P&O logo). 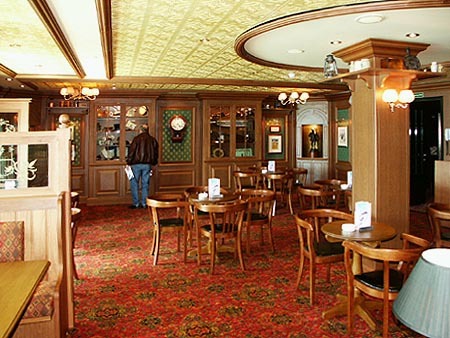 Florida Deck 2: The Rising Sun Pub. 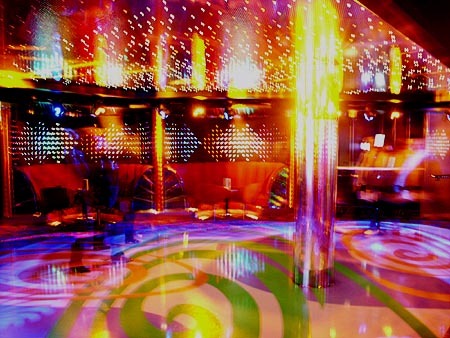 Florida Deck 2: The Electra Night Club. 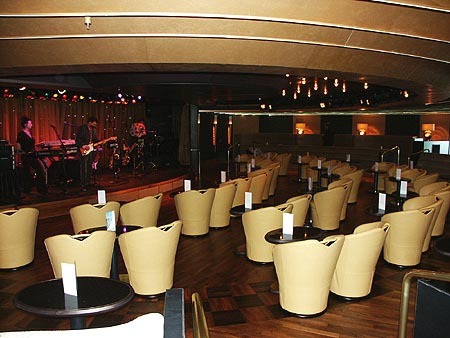 Florida Deck 2: The Globe show lounge. 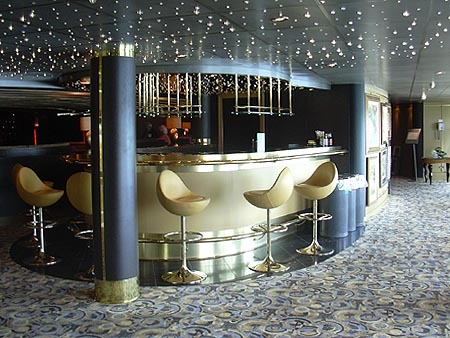 Florida Deck 2: The bar for the Globe show lounge. 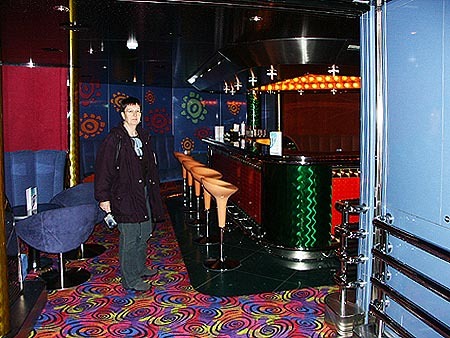 Photo &COPY; Margaret Boyle, 10th April 2005. 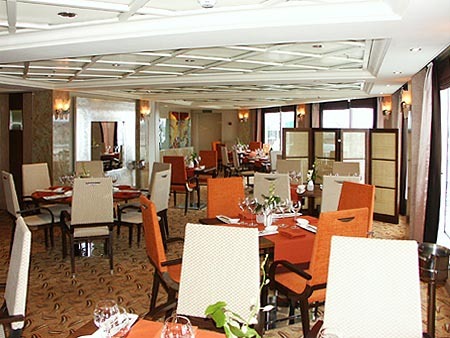 Florida Deck 2: Arcadian Rhodes Restaurant (cover charge), creation of Gary Rhodes. 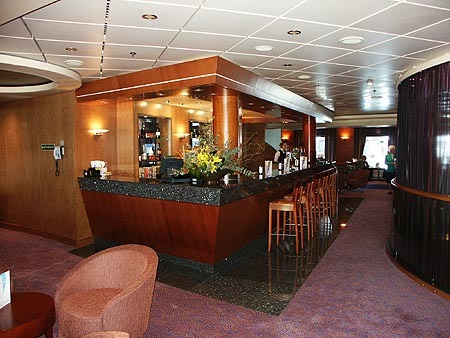 Florida Deck 2: The Intermezzo Bar. 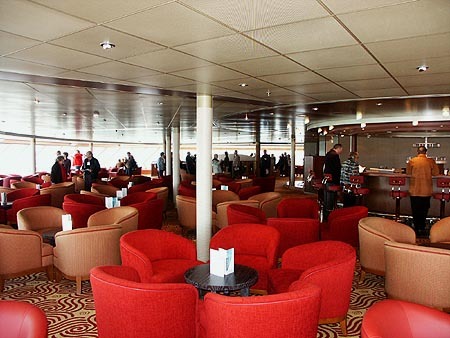 Florida Deck 2: The Spinnaker Bar. 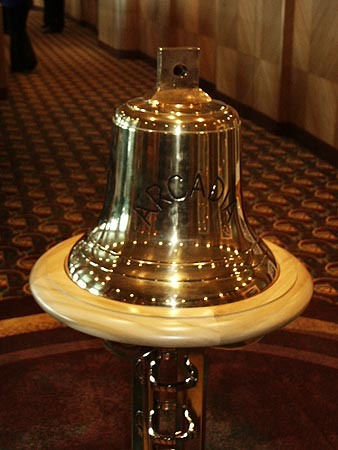 Florida Deck 2: The Spinnaker Bar - bell from the 1954 Arcadia (1). 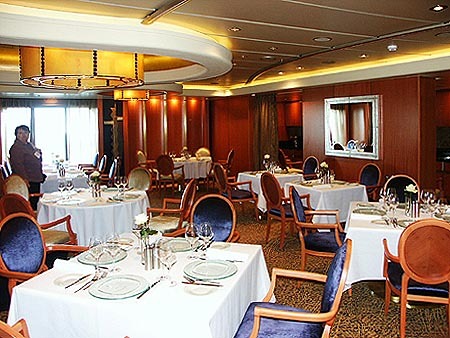 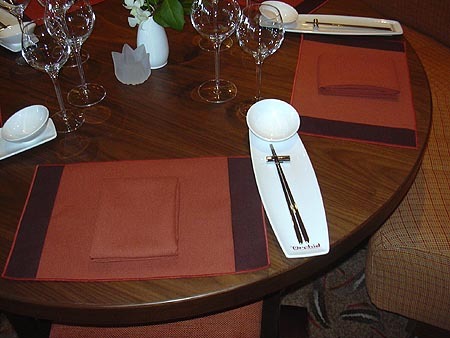 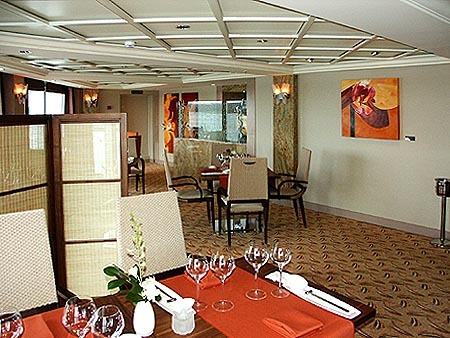 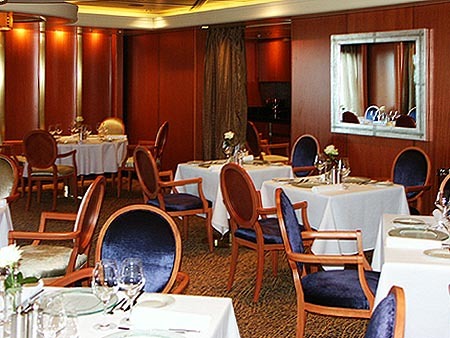 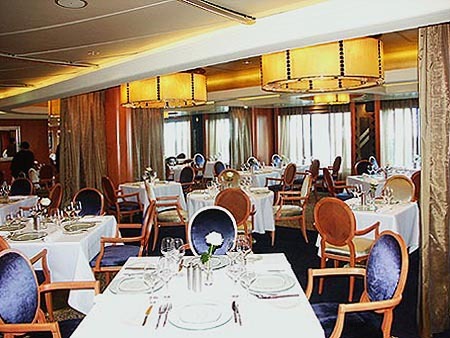 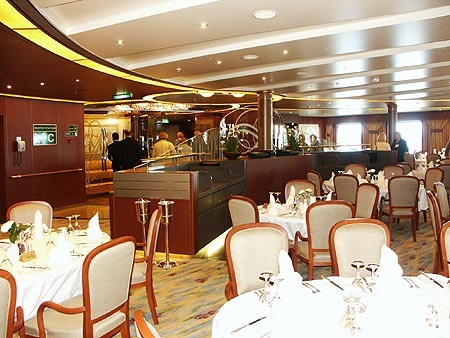 Florida Deck 2/Promenade Deck 3: Meridian Restaurant. 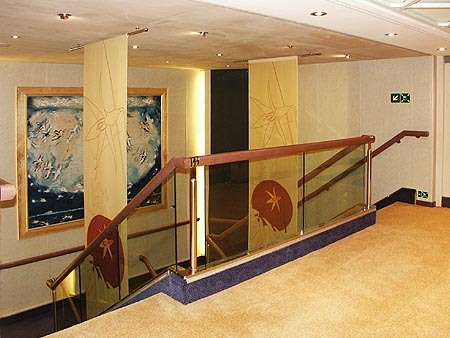 Promenade Deck 3 begins with the upper level access to the Palladium Theatre at the bow, followed by the Cyb@Centre (computer room with Wi-Fi access if you have your own laptop), Horizon Room, Cafe Vivo, Library (closed on my visit), Piccadilly shops, the Piano Bar (spanning the Atrium), Photo Gallery and the upper level of the Meridian Restaurant. 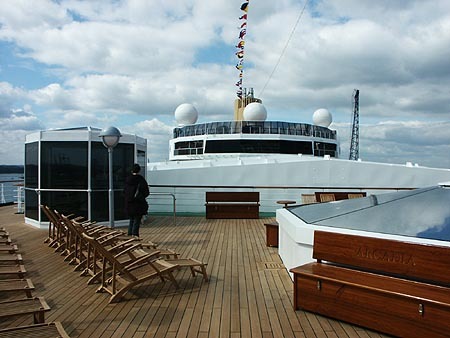 The kitchens are also on this deck. 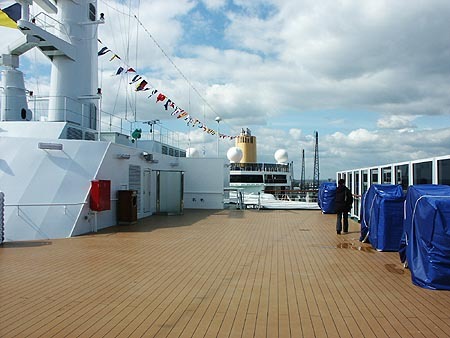 There is a circular outside Promenade on this deck. 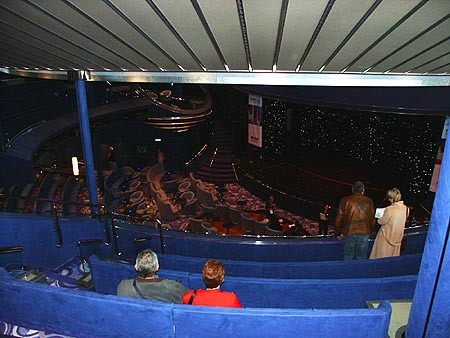 Promenade Deck 3: Upper balcony in the Palladium Theatre. 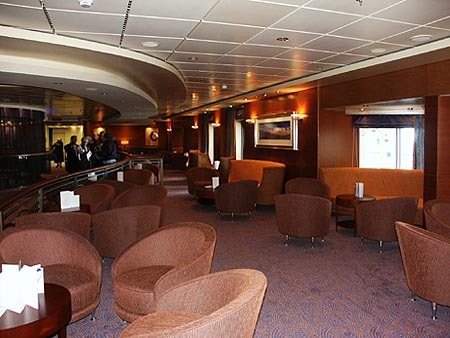 Wireless internet access is also provided for laptops (your own or hired). 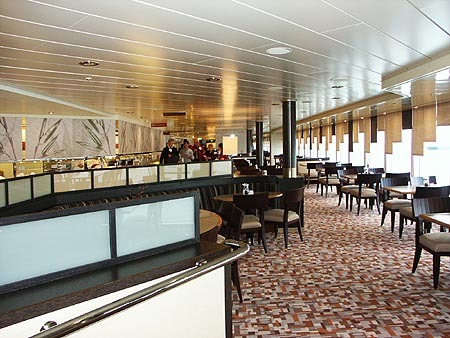 Promenade Deck 3: Cafe Vivo. 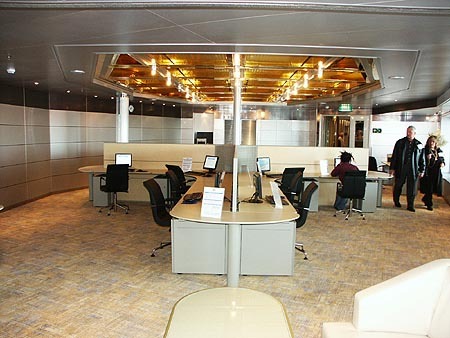 Wireless internet access is also provided in cage Vivo. 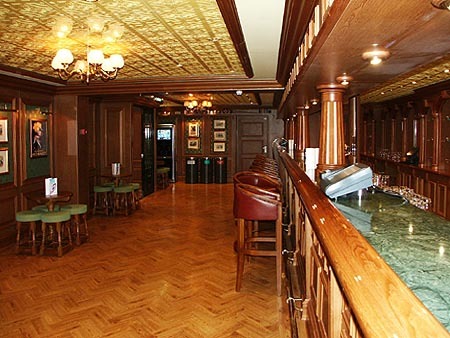 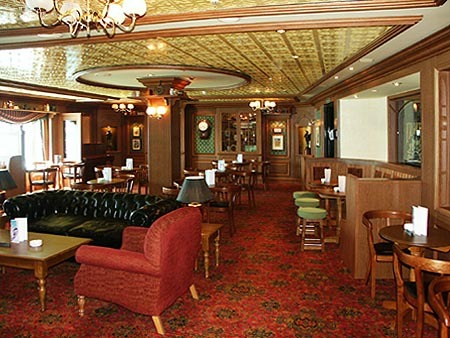 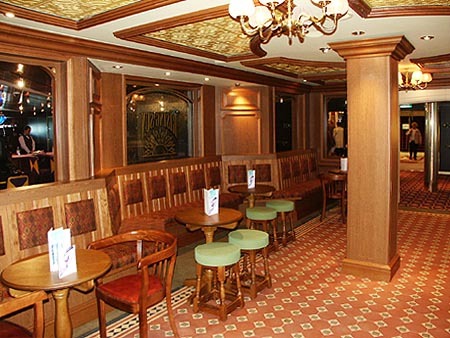 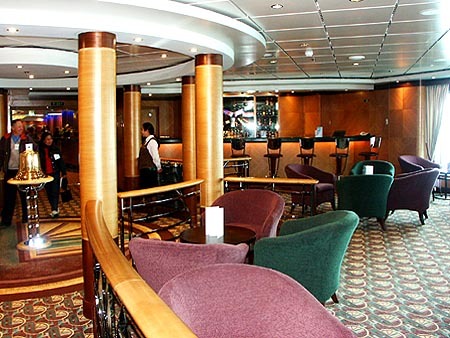 Promenade Deck 3: The Piano Bar. 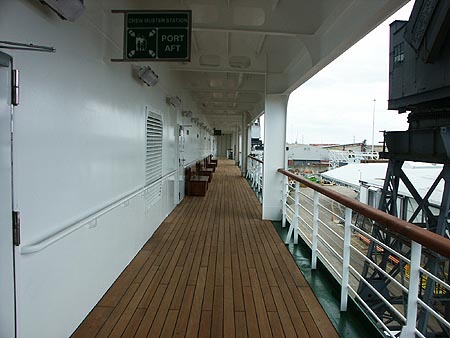 Promenade Deck 3: Starboard side, looking aft. 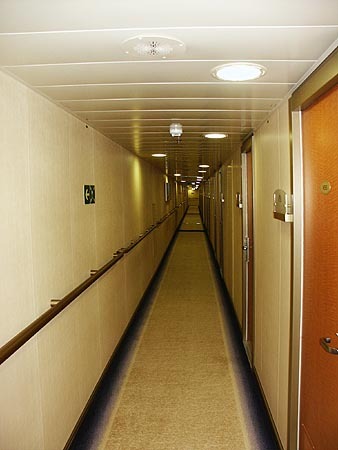 Promenade Deck 3: Starboard side, looking forwards. 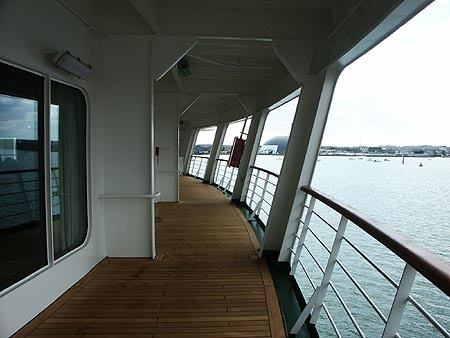 Promenade Deck 3: Stern, looking to starboard. 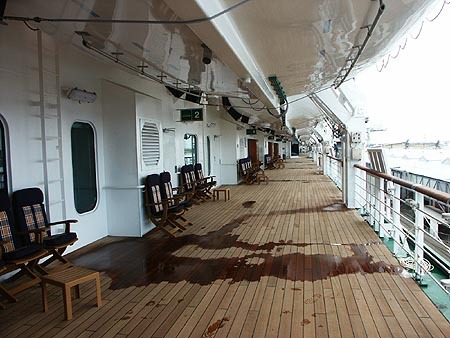 Promenade Deck 3: Port side, looking aft. 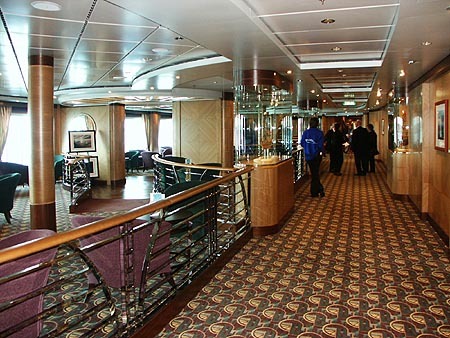 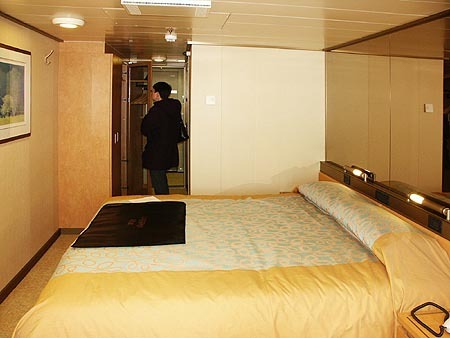 There are five decks of cabins, all outside cabins having balconies, above the Promenade Deck. 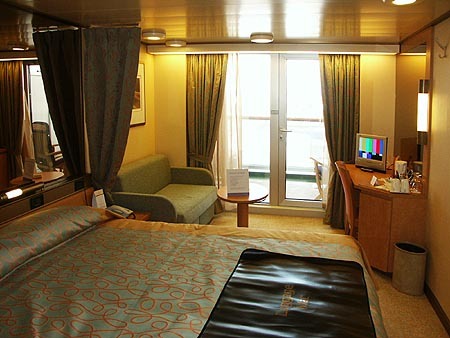 A Deck 8: Outside Cabin with Balcony. 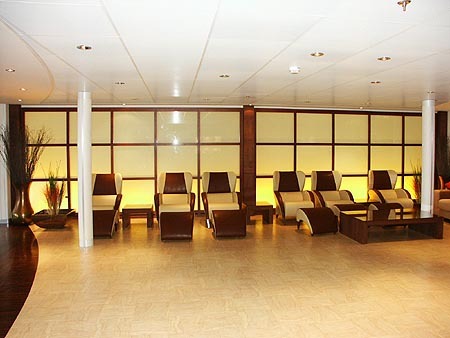 The Lido Deck 9 begins with the Gymnasium, Thermal Suite and Salon at the bow. 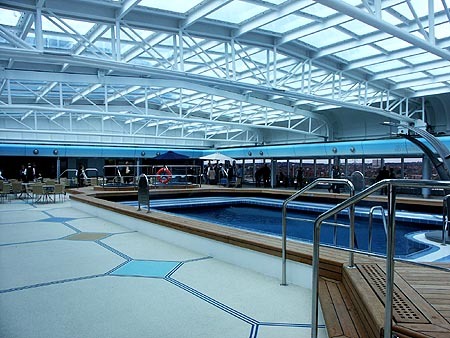 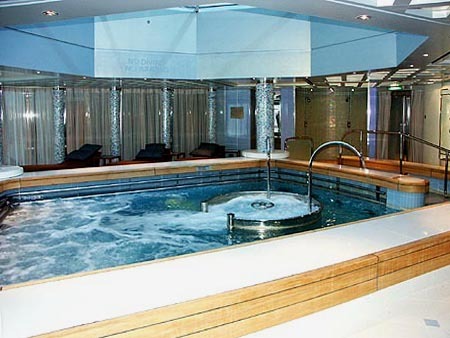 There is a Hydrotherapy (a first on P&O), opening onto the large Neptune Pool with a sliding Skydome roof. 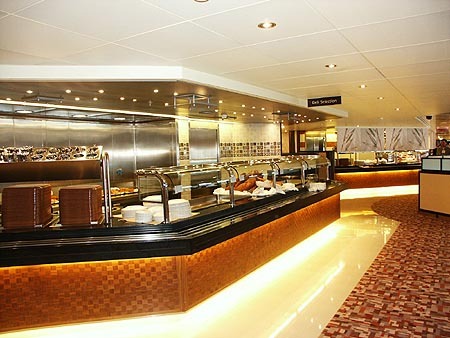 This connects to the Belvedere Food Court, and finally the Aquarius Pool aft. 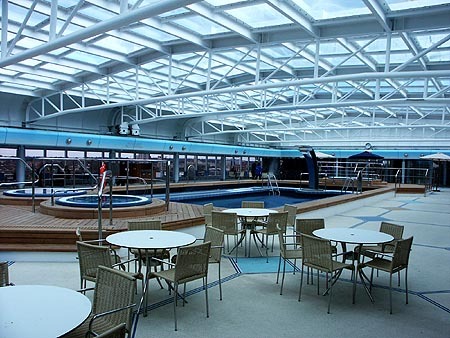 Lido Deck 9: The Gymnasium. 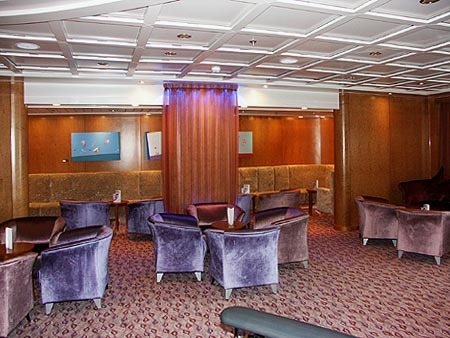 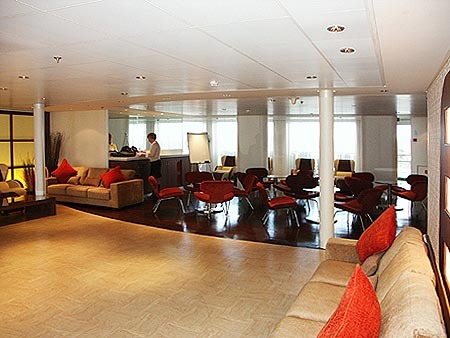 Lido Deck 9: Relaxing Area with heated loungers. 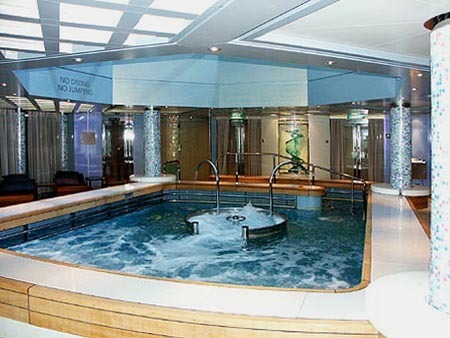 Lido Deck 9: The Hydrotherapy Pool. 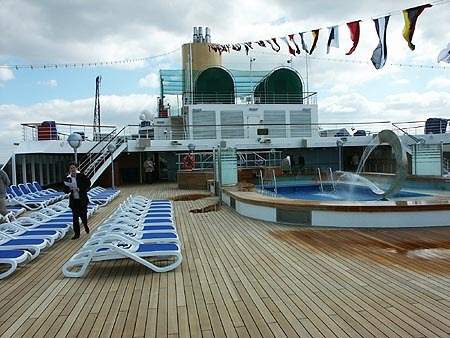 Lido Deck 9: The Neptune Pool. 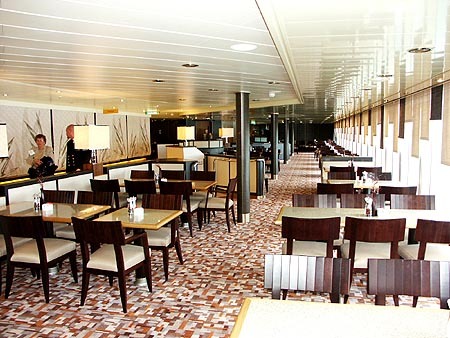 Lido Deck 9: The Belvedere Food Court. 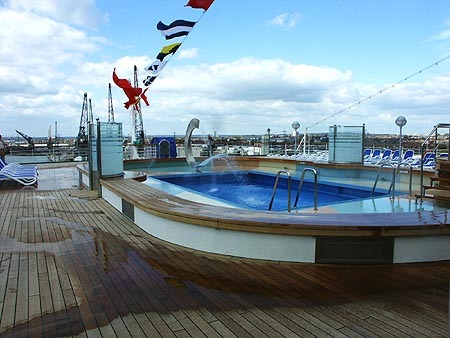 Lido Deck 9: Aquarius Pool, looking down from Sun Deck 10. 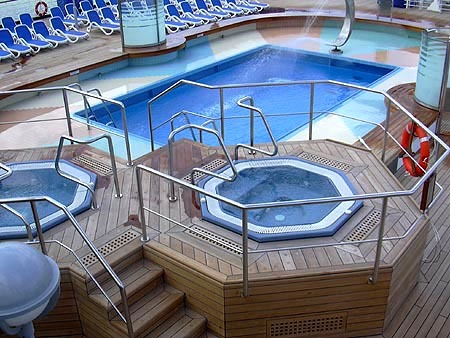 Lido Deck 9: Aquarius Pool. 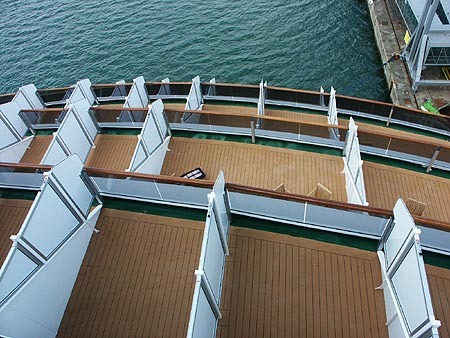 Lido Deck 9: Looking down on balconies aft (not very private!). 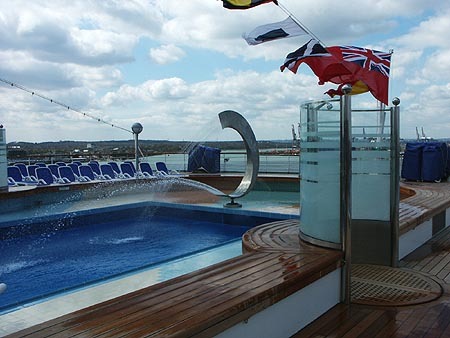 The Sun Deck 10 begins with the Crow's Nest Bar (above the bridge), The Retreat relaxation area and finally stair down to the Aquarius Pool aft. 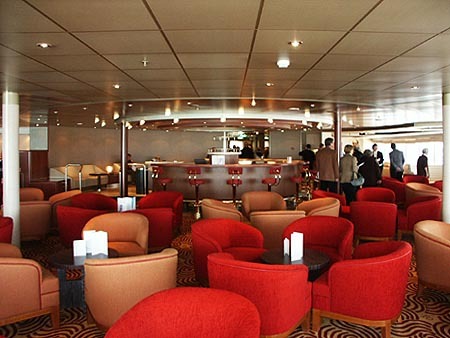 Sun Deck 10: The Crow's Nest Bar. 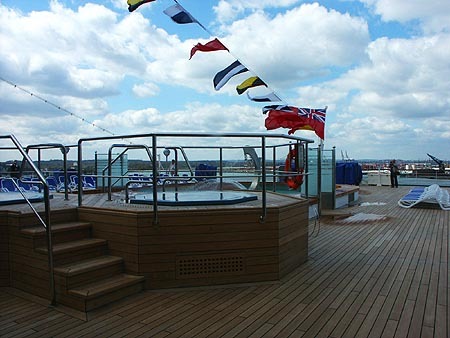 Sun Deck 10: Forward Lifts & Stairs outside the Crow's Nest. 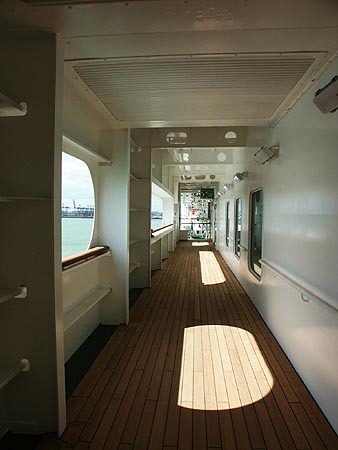 Sun Deck 10: Looking aft from starboard side. 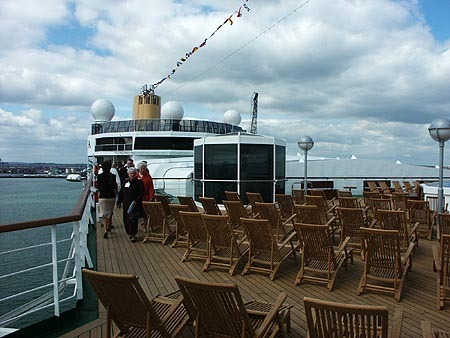 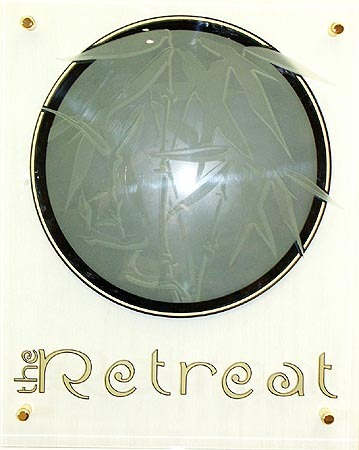 Sun Deck 10: The Retreat. 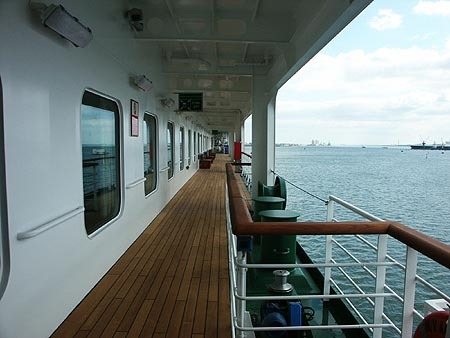 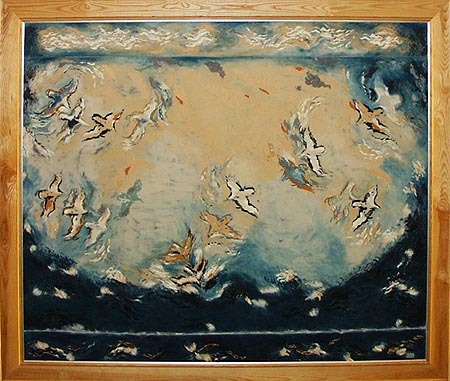 Sun Deck 10: Looking forwards from starboard side aft. 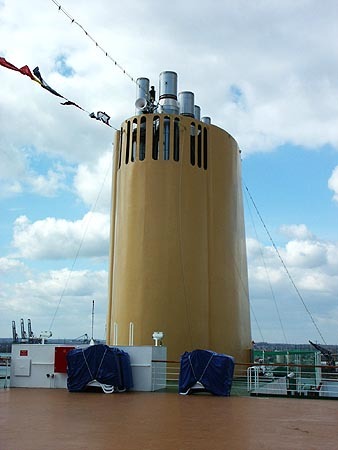 Sun Deck 10: The funnel from starboard side aft. 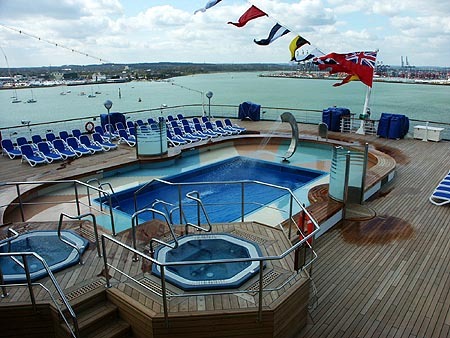 Sun Deck 10: Looking forwards on port side from the Aquarius Pool. 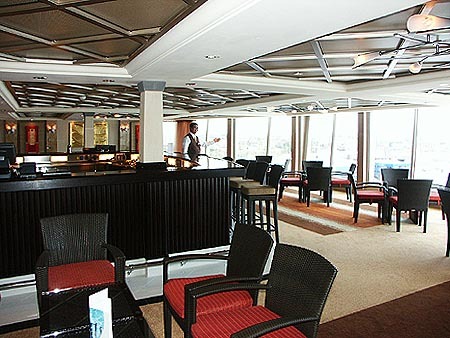 The Sky Deck 11 begins with a viewing area and sun deck above the Crow's Nest Bar, and a separate area midships containing the Ochard Bar and Restaurant. 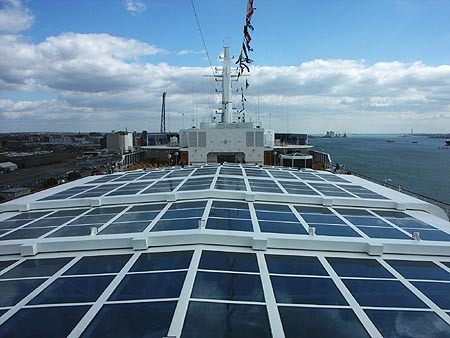 Sky Deck 11: Looking aft from port side. 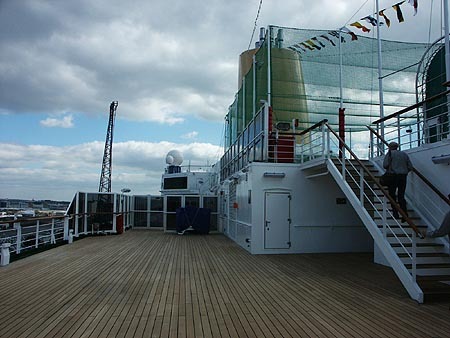 Sky Deck 11: Looking aft from starboard side. 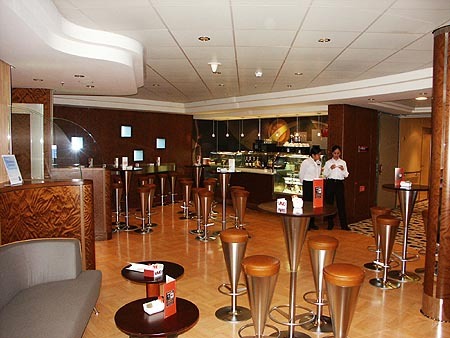 Sky Deck 11: Looking forwards from outside the Orchid Bar. 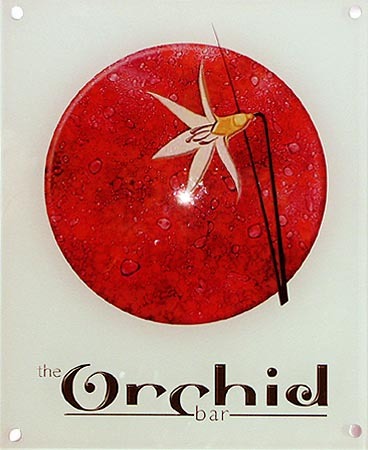 Sky Deck 11: The Orchid Bar. 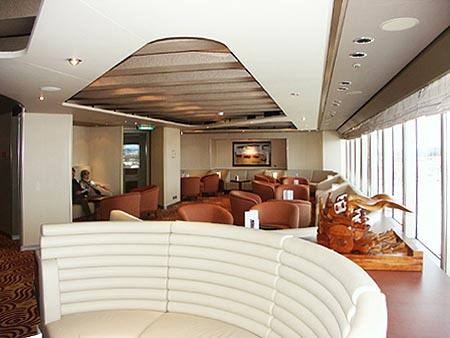 Sky Deck 11: Looking forwards from inside the Orchid Bar. 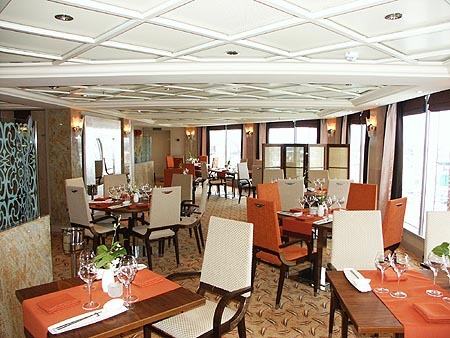 Sky Deck 11: The Orchid Restaurant. 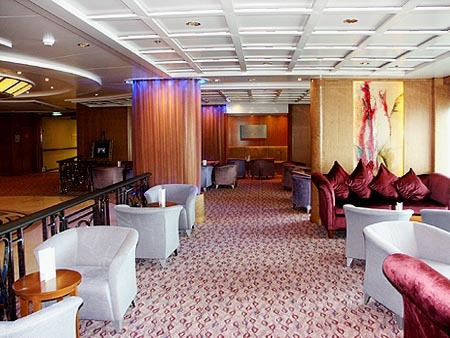 Sun Deck 11: Midships stairs, outside the Orchid Bar & Restaurant. 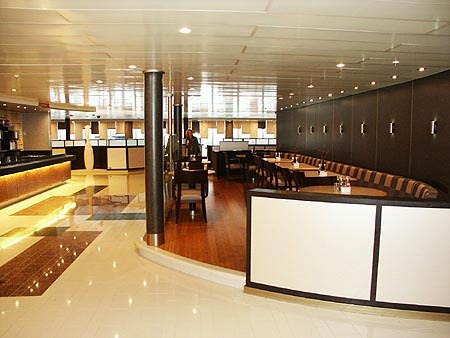 Deck 12: Looking aft from above the Orchid Bar & Restaurant.